Welcome to the first blog post! I’m super excited to bring you more good stuff in this format that is going to help you up-level, quantum shift and manifest on auto-pilot. Not having confidence or not feeling like you are able to do something is something I know a lot of people are challenged with. We all put conditions on when we will allow ourselves to feel something or get into a certain state. So some people allow themselves to feel confident when they’ve done something successfully before, some when they’ve done something similar, some when they’ve seen someone else do it, etc. And the truth is that feeling confident is a decision. You get to decide when you will feel confident and the moment you experience confidence, at whatever point that is, happens in a split second. The only thing that gets you across the bridge is the decision. I will be going deeper on all of these ideas in my course Mindset to Manifest which is a 4 part course that helps you cultivate a mindset that allows you to manifest your reality and teaches you practical and spiritual tools you can apply for the rest of your life. The biggest and probably most detrimental thing you can do when you’re feeling lack of confidence, confusion, nerves or whatever other negative state you’re feeling is to say “I’m feeling so _________”. When you do this you’re putting that vibration out into the Universe so that’s exactly what will be reflected back to you. Now, I am not telling you not to feel your feelings, but it’s very important to be aware of your vibration and not get stuck in a downward spiral that will keep you in the negative state. So how do you get through this? My favourite way and the most successful thing I do is to say and affirm how I actually want to feel. I repeat it over and over again and write it down and say it out loud and anything else that will helps me FEEL into that feeling and start to raise my vibe and get me feeling better. How you’re feeling is what the Universe will reflect back to you. Change these up to suit your specific situation and do what makes you feel good. 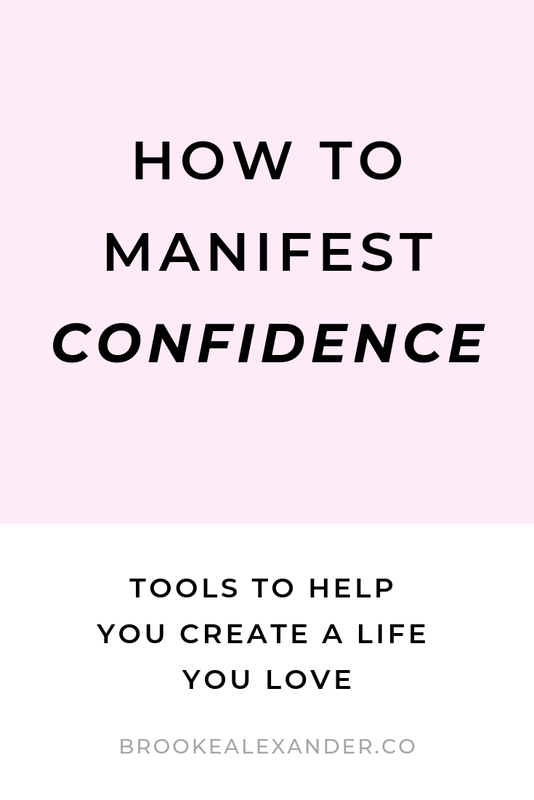 We go deep on this in Mindset to Manifest so if you’re reading this in time you’ll be able to sign up to attend live so you can ask specific questions you need help with. EFT (emotional freedom technique) is one of my favourite tools to help me work through any negative feelings or thoughts I’m having to shift my energy and get me feeling better instantly. It’s soooo easy and has amazing results, doesn't cost a thing and you do it to yourself without any extra tools required. It works by tapping on certain energy meridian points on the body with your fingers which sends a message to the amygdala to signal that what you’re thinking about isn't dangerous so you don’t need to produce any fight or flight chemicals, which are what cause the negative feelings inside you. I recorded a YouTube video you can watch here which takes you through the exact process and teach you how to do it. I also offer single session shifts where we will go through a custom tapping experience specific to your current situation so you can send me an email if this is something you’d like to do. Tapping in this situation is super helpful because it is helpful for you to change your state and therefore raise your vibration. Feeling good will get you more feeling good so even just feeling a little better is going to help you do what you need to do and get you out of a downward spiral. We go over tapping in Mindset to Manifest as well. The law of action states that action is required in order to manifest anything we desire. Action in the direction is required or you won’t be able to manifest your intentions. The law of cause and effect states that so long as you take action there will be a corresponding effect to the same degree. So if you take a small, positive action there will be a small, positive effect. Let’s say you’re totally devoid of confidence for the thing you want to do. None at all. How do you take action? You focus on the one next, most closest step in the direction of your goal that feels good. Ask yourself; what would feel good and exciting to do right now? Even if it’s small. If it feels good and it’s in the right direction, that's EXACTLY what you’re meant to do. That’s what the Universe wants you to do and you will be rewarded. Don’t focus on the end because that can make things more overwhelming. Just focus on the one next thing that feels fun and that's your only job. This is another topic we go deep on in Mindset to Manifest so if this is something you would love to learn more about then I would LOVE to see you there.